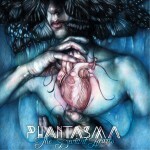 Share the post "Album review: PHANTASMA – The Deviant Hearts"
Phantasma is a project consisting of Georg Neuhauser (Serenity), Oliver Philipps (Everon) and Charlotte Wessels (Delain). Helping out are drummer Jason Gianni, bassist Randy George from Neal Morse’s band and Tom Buchberger (ex-Serenity) guests on two songs on guitar. I must admit the cover may lead some to think it is an extreme metal band! But delve inside and this concept piece has lots of big arrangements, powerful duets and more. The album starts with ‘Incomplete’, a piano led duet featuring Oliver Philipps and Charlotte Wessels. Wessels is a real star of the album and very impressive vocally, none more so than when she teams up with some of the guest vocalists. Pick of these is the title track that features Evergrey’s Tom Englund, who even in a quieter mode has such a powerful presence in his vocals. Chloe Lowery (Trans-Siberian Orchestra) and Dennis Schunke (Van Canto) team-up to great effect on ‘Try’. This is the sort of song that the Neuhauser and Philipps have combined so well together on in the songwriting and composing. ‘Carry Me Home’ is a fantastic piece of melodic rock, starting with an extended guitar solo before it kicks into a mix of Everon and Meat Loaf. Majestic strings sweep the song along coupled with another fine vocal performance from Charlotte Wessels. One of my songs of the year. This entry was posted in ALBUM REVIEWS, ALBUM REVIEWS (Mobile), All Posts and tagged Charlotte Wessels, debut album, Delain, Everon, Georg Neuhauser, Meat Loaf, melodic, metal, Napalm Records, Oliver Philipps, Phantasma, Queen, review, rock, Serenity, symphonic, The Deviant Hearts. Bookmark the permalink.